Want to travel faster than walking but not depend on a car? Try commuting or zipping around on errands with the best electric scooter. Worth the price and convenience, but no suspension. Powerful with great suspension, but front brake is slow and battery meter is unreliable. Zippy but more suited for kids. Easy and smooth operation, but long battery charge time yields short ride time/range. Don’t miss anything special. Subscribe now! 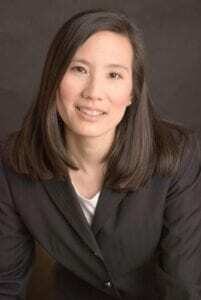 A writer, standardized patient, and former high school teacher, Helen loves learning and telling others about ideas, news, and everyday items and their uses. 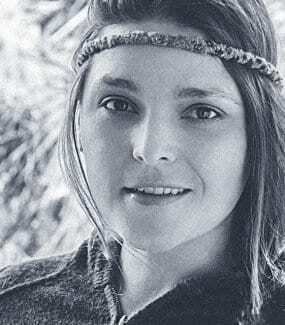 Helen also enjoys reading, knitting, seeing movies and theater, acting, dancing, and spending time outdoors. 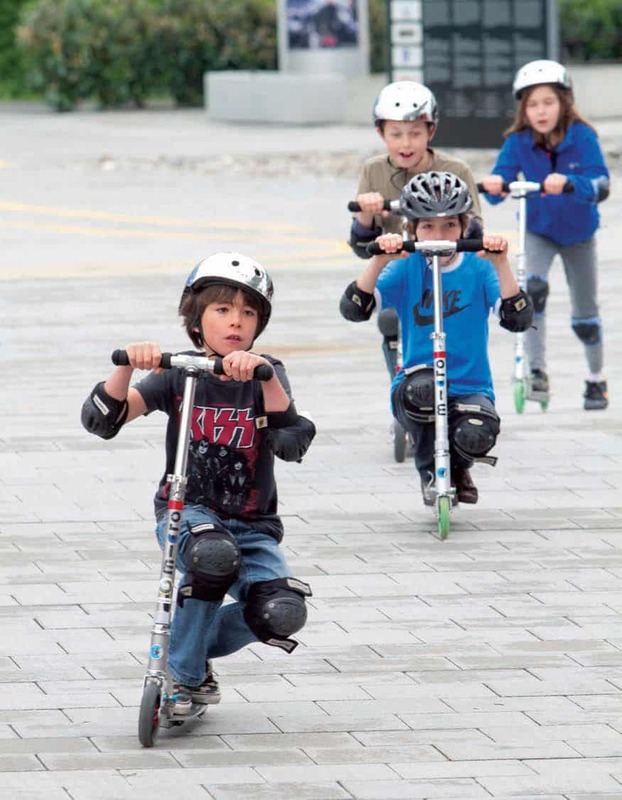 I bought manual scooters for my kids when they were young–and gleefully rode them myself! I also investigated motorized mobility scooters for my elderly parents. These electric scooters are a nice hybrid of my kids’ and my parents’ scooters, and I’d love to try them out. Scooters aren’t just for kids! Electric scooters are perfect for tooling around and exploring, running errands, and commuting for short distances - easily, economically, and emission-free. Learn about the best electric scooter for adults to get around while satisfying their inner child. 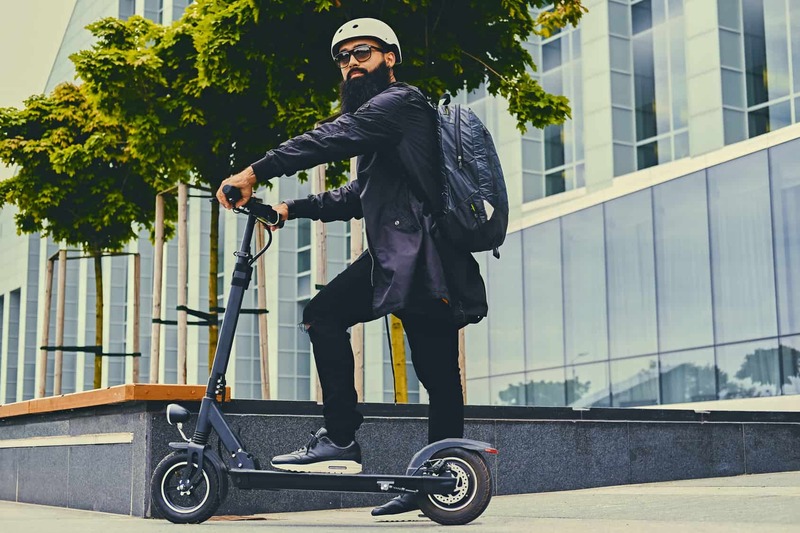 After researching over 30 of the most popular electric scooters, we narrowed the list down to these top picks. We consulted industry leaders and consumers to choose the eight top electric scooters. Before plunking down money to purchase one of these cruising machines, you should read what others already think about them. We pored over feedback from hundreds of owners of all different ages in order to investigate the good, the bad, and the ugly. We learned about electric scooter riders’ experiences with and opinions about specific models. We also double-checked each scooter’s specifications on its manufacturer’s website to confirm accuracy of information. Safety is paramount, so we want to communicate exact details about brakes, speed, durability, and more. …and learn about electric scooters in general and specific models. When shopping for an electric scooter, first think about how you plan to use it. Will you ride it to commute to work (or at least part of the way in order to catch public transportation)? Do you plan to use it for running errands or for recreation? How far do you need to travel and over what kind of terrain (e.g., urban, suburban, or rural)? 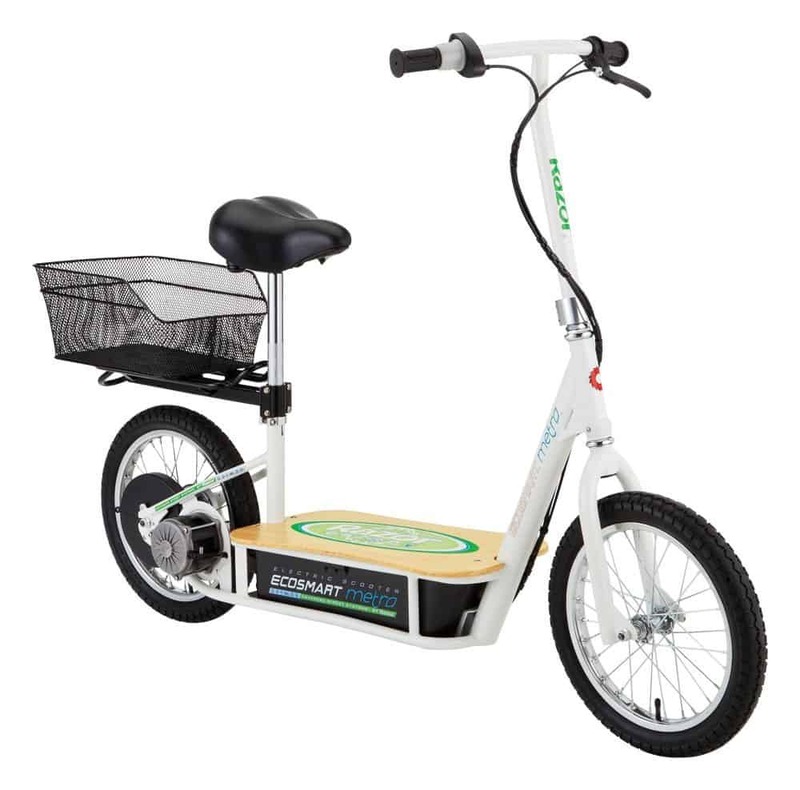 Consider your needs and then investigate each model’s features, including its size, maximum weight capacity, range and ride time (how far and long it runs on a single battery charge), speed, style (seated vs. standing, foldable or not), reliability, and performance. Many of the above factors depend on the scooter’s parts. Things like its battery, engine, and brakes. Examine each model’s specifications to make sure they fit what you need. Just as every person is unique, each electric scooter model is different. Most models accommodate weights of at least 120 pounds, but we included ones that carry up to 250 pounds or more. Range is how far the scooter can travel on a charged battery. Ride time is how long it can run on a charged battery. Range and ride time are calculated with the scooter driven at full throttle on flat ground. So, if you have a nine-mile one-way commute to work, make sure your scooter has a range of at least 10 miles. Don’t get carried away and exceed your scooter’s range–or you may end up stranded with a dead battery. Rider weight, speed, and terrain all affect range and ride time. The heavier the rider, the faster the speed, and/or the steeper the incline, the shorter the range and ride time will be. The battery, its power capacity (voltage), how long it holds a charge, and how quickly it recharges also affect range and ride time. Various types of batteries produce different levels of power and require varying charge times. In the above example–a nine-mile one-way commute to work on a scooter with a 10-mile range–you’ll need to recharge the battery during the workday. How long will it take for the battery to recharge completely? 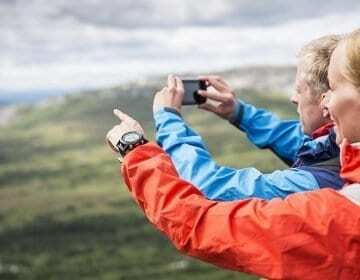 Will you have enough time to recharge the battery before your nine-mile return trip home? Lead – Lead batteries are inexpensive to produce, efficient, and long-lasting. However, they require a long to charge (e.g. at least 12 hours) and can be heavy. Lithium-ion – Small and light, lithium-ion batteries won’t weight down the scooter much. Another plus is that they require less time to charging time (e.g., one to three hours at most). Unfortunately, lithium batteries aren’t inexpensive and thus drive up the price of the scooter. Although electric scooters are emission free because they’re powered by batteries and not gas, we can’t ignore batteries’ environmental downsides. The manufacture and disposal of batteries pollute the environment. Also, obviously the batteries’ power has to come from somewhere. Unless you have a solar panel charger for your electric scooter’s battery (like this one), the electricity source you use to recharge the battery probably obtains its energy from coal-fired power plants. When you need to replace your scooter’s battery, please dispose of the old battery responsibly. Check with your town’s large battery disposal rules. Also, inquire if local auto part stores or recycling centers accept them. In any case, please don’t simply dump your scooter’s old battery in the regular trash. At least 250 watts is good for kids’ scooters. 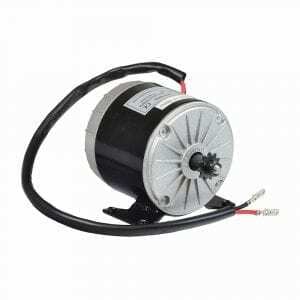 You may want a more powerful engine, like 500w to 1000w. The higher the wattage, the higher the price, so think carefully about how much power you actually need. The chain-driven engine: Scooters with this type of engine have a continuous metal chain linking a small sprocket gear to a larger gear on the rear wheel.Powered by the battery, the motor rotates the sprocket, which moves the chain, which turns the rear wheel…and propels the scooter forward.Chain-driven engines are efficient and powerful. Their downsides, though, are the weight of the chain and surges (speed variations). The chainless hub motor: This is an electric motor located within the hub of the wheel, eliminating the need for a chain to connect the motor to the wheel and turn it.Hub motors are efficient and prevent surges, but result in heavy wheels, more vibrations, and bumpier rides. Manual scooters have foot brakes where the rider pushes down the cover of the back wheel, creating resistance between the cover and the wheel to slow and stop the scooter. Handbrake: A clutch on the handlebar is connected to a disc brake mounted on the front or rear wheel. When you squeeze the clutch, it creates pressure on the brake disc, which slows down the wheel. Electric brake system: Often found on hub motors, electric brake systems increase resistance between magnets inside of the motor, making it (and thus wheel in which it’s located) eventually stop.Electric brake systems that recharge batteries during braking are called regenerative braking systems. Top speeds for small electric scooters range from about 10 to 30 miles per hour. The models we review top out at 27 miles per hour, and that number varies depending on the terrain and rider’s weight (i.e., hills and heavier riders reduce speeds). For safety, as well as legal reasons, you may not want to go faster than 15 miles per hour so. We’ll talk more about this and other safety recommendations after the reviews. How does the model feel on the average road–smooth or bumpy? Does it perform well on inclines as well as on flat ground? Electric scooters of any size are investments. You want the model you choose to last. Its lifespan depends on usage (i.e., frequency, distance, and terrain of rides), maintenance, and construction. Does the model come with a seat? And if so, is it removable? Some people prefer riding standing up while others like to sit. 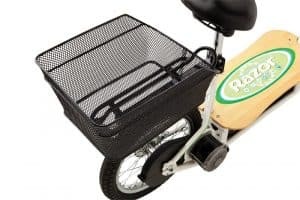 Does the scooter fold up to carry and store away easily? This feature may be important for commuters but not so important for recreational riders. While not one of the most important features, a scooter’s appearance (especially choice of colors) can affect riders’ choices. Some want to look cool while others don’t really care. The Super Turbo 1000watt Elite 36v Electric Scooter is super sturdy and powerful. Reviewers love the “great” ride and that they look “cool” on their way to work or just tooling around. The Super Turbo 1000watt Elite 36v Electric Scooter’s turbo motor makes it fast and strong. Several riders love its power and report the scooter climbs hills on turbo with no problem. The manufacturer sells a supplementary hill kit for riders who want even more of a boost. People close to, at, or even a bit over maximum weight (250 pounds on flat ground) feel the scooter handles well and doesn’t lose power or speed during drives. Looking for a change of pace? The scooter allows riders to adjust power with an Econo/Turbo mode button. Those who aren’t in a hurry and wish to just cruise can–and will really feel the difference between the turbo and econo modes. Accelerate at your own pace–from very slow to slow to medium to fast to very fast–very gradually or within several seconds. The main concern about the Super Turbo 1000watt Elite 36v Electric Scooter is its braking performance. In fact, it weighs 92 pounds--61 pounds without battery. One rider, Joseph, commutes through a hilly area and admittedly rides his brakes “a lot”. However, after a few weeks, he discovered the brakes began requiring a longer stopping distance. Going down a hill is “scary” because the brakes "slide" even after tightening. A third rider in a hilly area who “really uses the brakes a lot” says that after a month, the brakes were not as effective as they were earlier. One of experts, Steve, who also happens to own this electric scooter, added the brakes “don't seem to grab” as well as expected--even from the first day of use. While the brakes do work, he suggests squeezing them firmly and learning to anticipate stops. The Super Turbo 1000watt Elite 36v Electric Scooter’s front and rear brakes need frequent adjustments. A few people found and viewed a video on the manufacturer’s website providing step-by-step instructions on adjusting the brakes. For some, that did the trick, but for at least one other person, the adjustment changes didn’t help. Another maintenance tip is to check and tight bolts before rides because they loosen during rides. For most people, the lead battery lasts long and is fine. A few people plan to switch to lithium batteries. While the Super Turbo 1000watt Elite 36v Electric Scooter folds up for convenient storage, it is heavy to carry. Finally, purchasers of the Super Turbo 1000watt Elite 36v Electric Scooter praised the manufacturer’s excellent customer service and rave about Chris. To see a review and demonstration of this model by a new owner, watch this video. 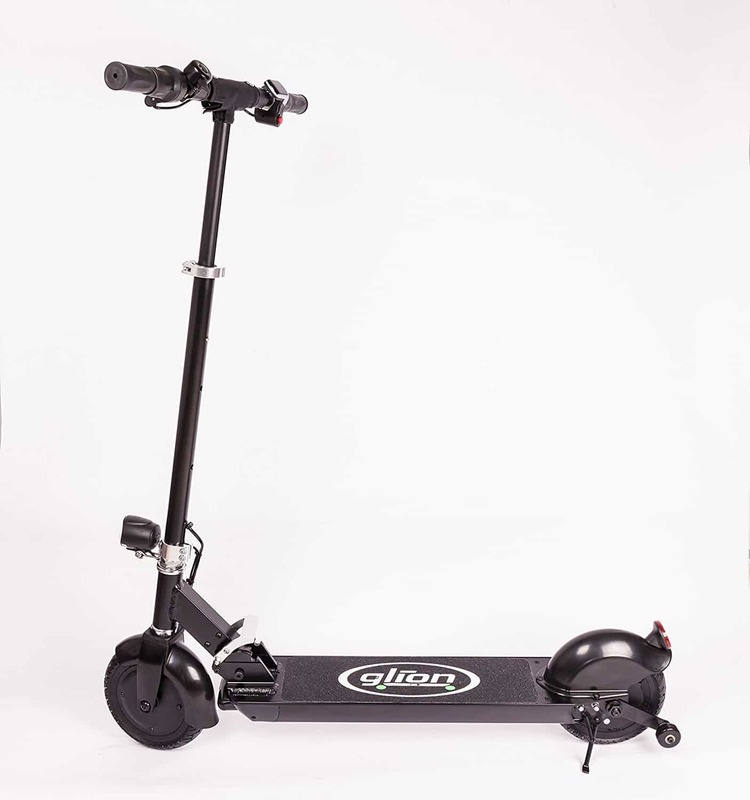 Well designed and engineered for adults, the Glion Dolly Foldable Lightweight Adult Electric Scooter appeals to a wide range of riders. This scooter is solid and durable. After using it for daily commutes across campus for two years, a happy owner states it’s still going strong for urban transportation. One commuter we spoke too, Sutton, rides about one hour each way, each day. She leaves home with a fully charged battery and arrives with a still decently charged battery. The battery indicator/meter shows how much “juice” is left via the number of bars. Many people think the indicator is too vague, wishing it displays percentages of battery power left. All of our experts were sure to mention how they dislike the scooter’s lack of a speedometer and odometer. The battery certainly pulls riders’ weights over inclines. A 250-pound commuter, Sam, rides this scooter daily over a “legitimate hill” and enjoys the scooter’s consistent climbs without stops or push assists. Another 220-pound rider, Jackie, also says the scooter handles hills well. The Glion Dolly Foldable Lightweight Adult Electric Scooter’s electromagnetic regenerative brakes are steady for some and jerky for others. 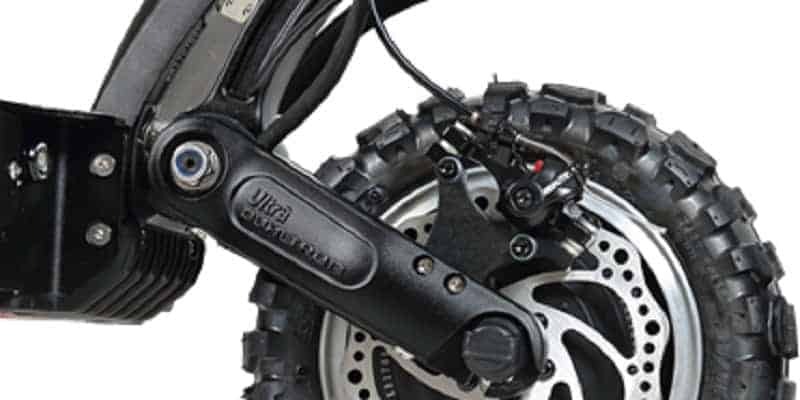 Many riders would feel more secure with an additional mechanical/manual brake for back-up. Several people note the brake is good for adjusting speed going around corners, but not for stopping quickly to avoid hitting a person suddenly walking into the scooter’s path. 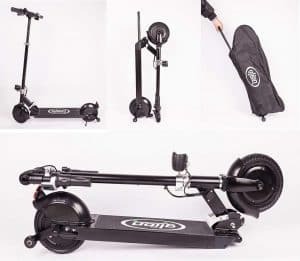 The Glion Dolly Foldable Lightweight Adult Electric Scooter doesn’t have a suspension, just large tires to absorb little bumps and cracks in the road. Forget rough terrain, even with small branches or rocks, the ride is much rougher and less stable. Foldable and portable, the scooter has a unique pull handle dolly and wheels that allow users to stand it up and roll it like luggage. People love this convenient feature. Less convenient is the position of the On/Off power button that’s easily accidentally pushed when the scooter is folded. Riders describe the manufacturer’s customer service as “off the charts amazing,” “spectacular,” “phenomenal,” “outstanding” and more. Watch this video of a new owner’s demonstration and review. The Pulse Performance Products GRT-11 Electric Scooter seems to be another scooter more geared toward kids. Most feedback was from parents and grandparents of children ages five to eleven. 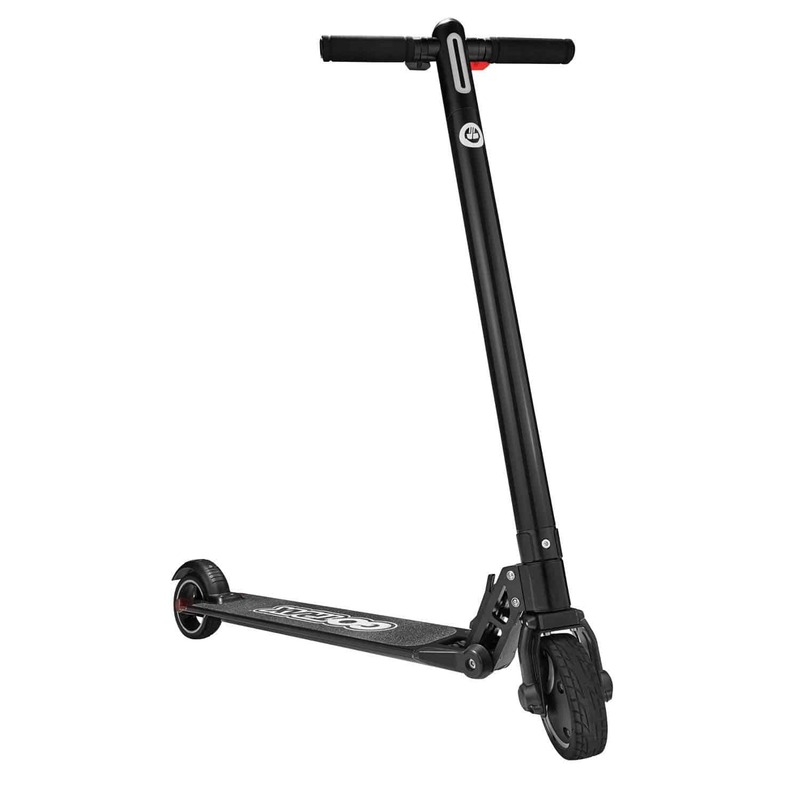 This scooter is sturdy, strong, and holds riders weighing up to 120 pounds. It’s “zippy but not too fast,” easy to ride, easy to handle, and easy to stop. 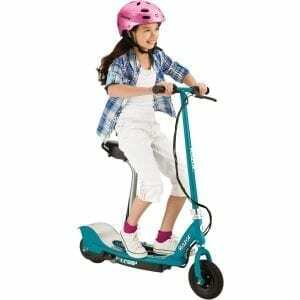 Overall, this model is well suited for beginning scooter riders. With a top speed of eight mph, it’s perfect for riders not in a hurry. The battery is adequate. Thouhg, some users wish it would hold a charge longer than an hour. 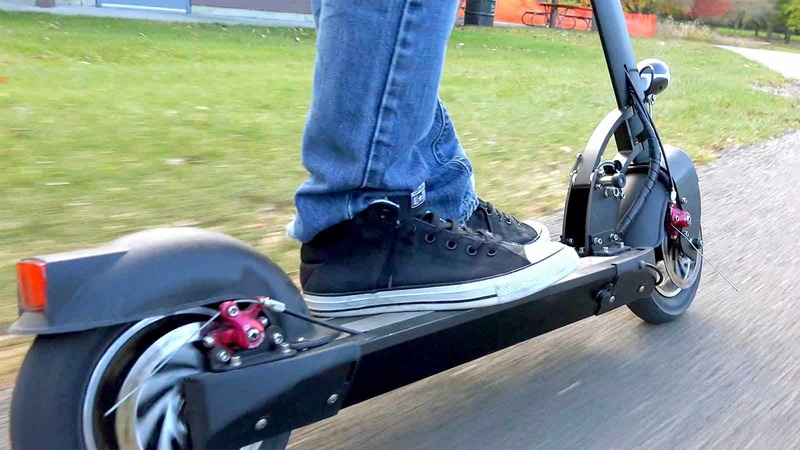 One person describes the scooter as “underpowered” because it couldn’t propel a 60-pound passenger up an incline. Although easy to assemble, the scooter seems to have issues with parts and quality. Two people report kickstands breaking soon after the scooter’s first use. Several note the scooter arrived damaged. Finally, some users state that despite lack of roughhousing, the scooter or its parts broke shortly after early rides. 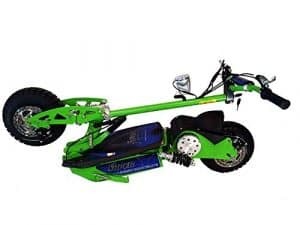 See for yourself the quality and functionality of the Pulse Performance Products GRT-11 Electric Scooter in this video review. The Razor EcoSmart Metro Electric Scooter is perfect for commuters and adults of all ages (including older teens and senior citizens). Its sturdy, heavy-duty, and easy-to-assemble frame offers stability while its padded adjustable-height seat and solid bamboo deck provide comfort for a smooth ride. 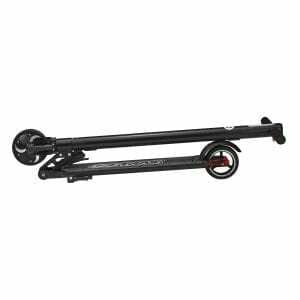 With no suspension, this model can have a bumpy ride on rough surfaces. Several people didn’t find the seat comfortable. They actually switched to another one. The Razor EcoSmart Metro Electric Scooter is excellent for running errands, carrying groceries (in a detachable rear rack), and commuting. 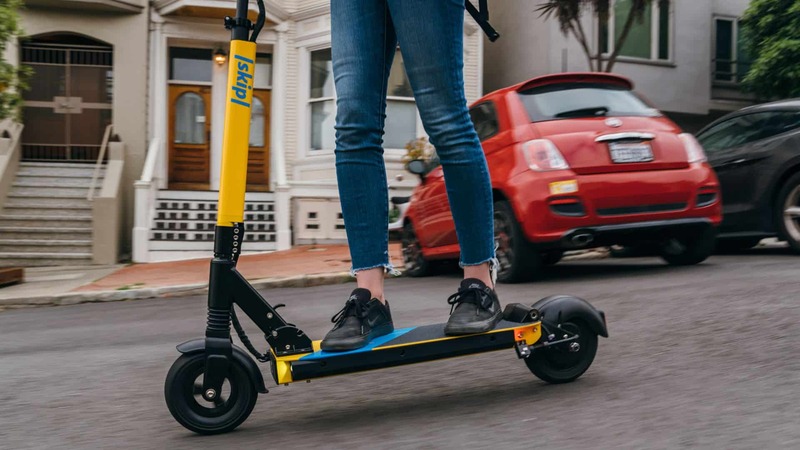 One person says the scooter is a great automobile “replacement” for short trips close to home. Another rider commutes 12 miles through a city on a single charge. 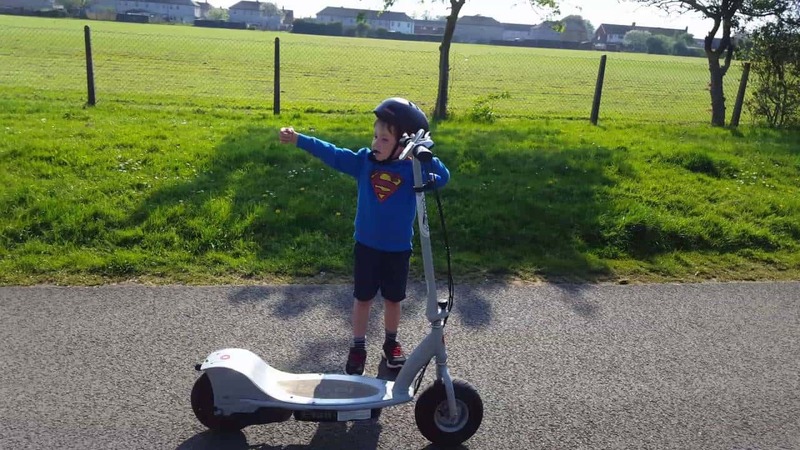 A third user finds the scooter’s range for rolling, hilly terrain to be about seven to eight miles. After each ride, the battery is easy to charge. Although, we read reports of the battery indicator not being very helpful, as it doesn’t always show when the battery is low or displays no percentage, just a green light that turns to yellow light when the battery is low. Several users grumble the battery holds a charge less effectively within several weeks, but after the 90-day warranty. Speaking of warranty, customer service received multiple negative ratings. With much use, the brake can overheat and becomes less effective. Many owners wish this model had a front brake as well for stronger and quicker stopping. Likewise, the motor located on the right side can get hot after a few miles, so be careful not to touch it then. The top speed of 18 mph is fast enough for many riders. Controlling speed and acceleration via the throttle can be a bit tricky for some. There have also been a few reports of a mystery “clicking” noise during rides. Our experts warn this may be related to the throttle or brakes. One reviewer noticed many users accidentally snap off the charge port cover. 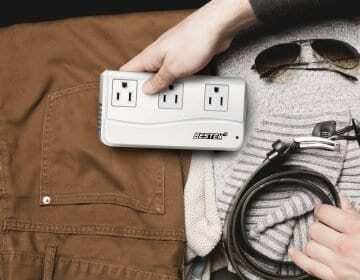 They noted the charge port cover is NOT a plug, but rotates or twists clockwise out of the way of the charging outlet. To see the unboxing, assembly, and helpful review of the Razor EcoSmart Metro Electric Scooter, watch this video. 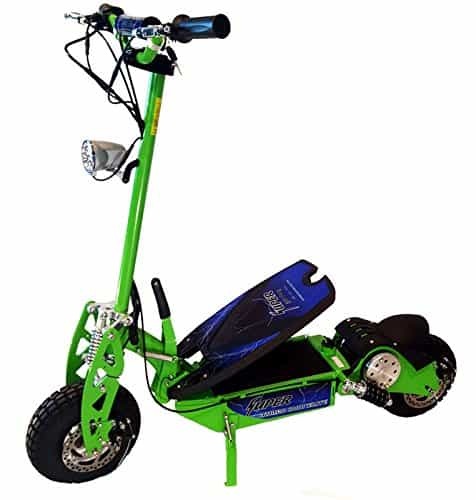 The GOTRAX Glider Electric Scooter for Kids & Adults is popular with teens and young, middle-age, and senior adults. Stable, sturdy, and heavy-duty, this model is safe and comfortable for kids and grown-ups. One 6’5”-tall rider tried and likes it but thinks that people in the 5' to 5'11”-tall range are ideal. A self-described “large frame” person weighing 240 pounds finds the scooter fast and powerful. 1) Push the red power button once to turn on the scooter. 2) Double click the button to switch to second gear, as indicated by two rows of vertical lights. 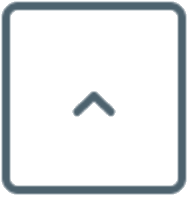 3) Double click again to switch back to first gear, as indicated by one row of vertical lights. Cruising on the GOTRAX Glider Electric Scooter for Kids & Adults is smooth for many people, but we also found complaints of bumpy rides. The scooter’s hard rubber wheels and lack of suspension result in riders feeling every vibration from road cracks, pebbles, and sticks. A few reviewers warn riders to watch out for potholes and rocks because it’s “easy to fly off” when hitting a bump. Helpful advice: bend your knees a little to help absorb shocks. While the brakes work well for some–one person noted they were effective even while rolling downhill– they’re not hydraulic. Therefore, you’ll need brake sooner/earlier in anticipation of stops because immediate stops are almost impossible. 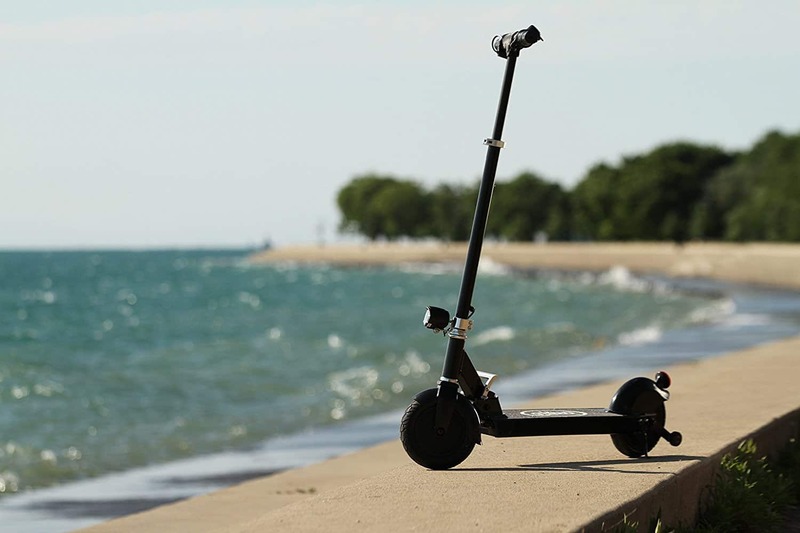 The GOTRAX Glider Electric Scooter for Kids & Adults’ battery is easy to charge and has a “good” life. Its nine-mile range allows for people to get out but not get stuck far away from home. 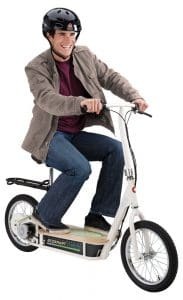 Even better, if you use the motor to assist your kick-propelling (instead of enjoying a completely free ride), you can save some battery “juice” and get some exercise. After one hour of continuous use, the battery still had about 75% charge remaining. Nonetheless, the battery declines over time. After several weeks, the battery’s range and ability to hold a strong change deteriorated for some users. A few reviewers don’t think the battery works well enough for inclines. Three features were overwhelmingly praised. First, the bright LED headlamp is “radiant” and “great for night riding.” Second, the GOTRAX Glider Electric Scooter for Kids & Adults folds up and is light for easy handling, transport, and storage. Third, the customer service and support are excellent. We just want to pass along reports of the handlebar breaking (three) or, due to lack of a screw coming apart (several), which led to injuries. To see this model’s manual, click here. 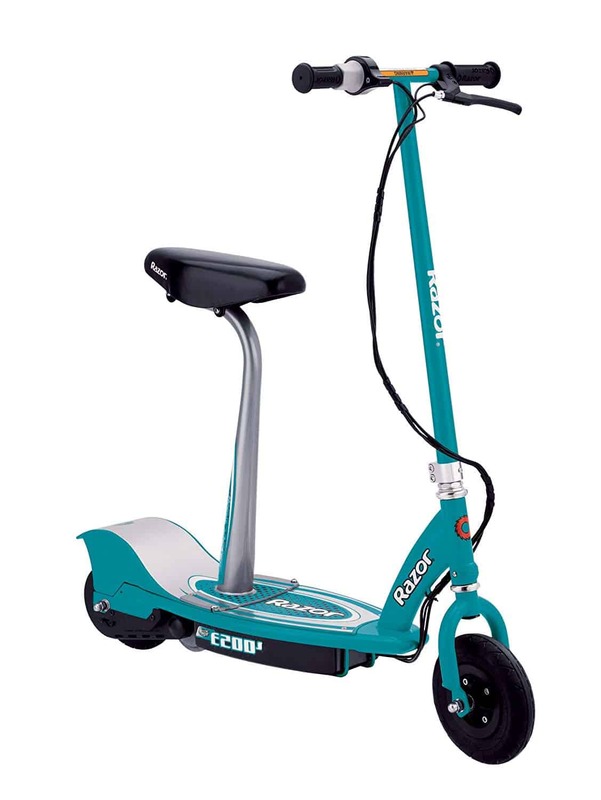 Powerful and fast, the USCOOTERS/e-TWOW Electric Booster Plus Scooter is great for commuting. Although a bit “heavy,” it zips along well for riders up to the maximum weight limit. 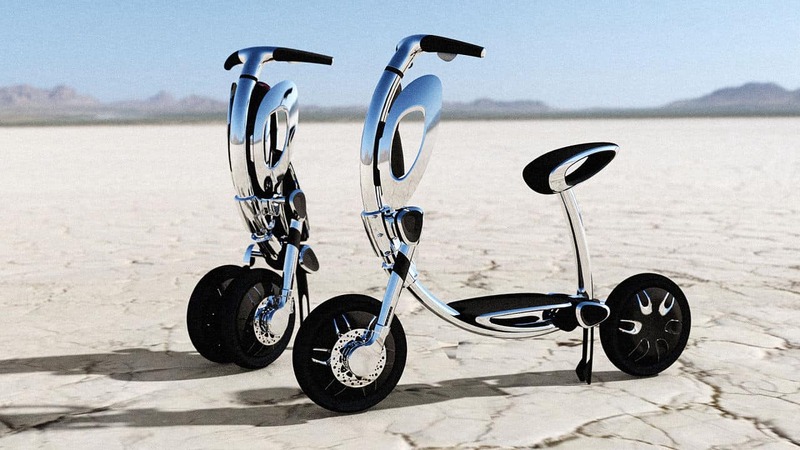 A six-footer weighing 230 pounds (plus a backpack) travels about 10 to 14 miles on a single charge up to 16 mph. A 5’11”-tall rider weighing 200 pounds speeds up to 19 mph on straightaways. Ranges and ride times can vary. One person reports reaching only 11 to 13 miles per change. Another says that the scooter drives reliably on flat terrain about 12 miles; going beyond that limit, the scooter slows down. What people agree on, though, is the USCOOTERS/e-TWOW Electric Booster Plus Scooter’s effective shock-absorbing suspension. 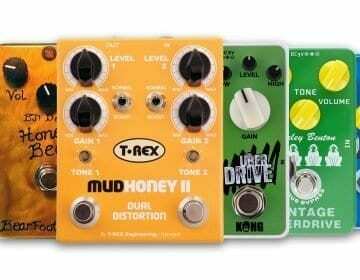 It handles bad roads, rough urban streets, and bumpy surfaces well. A less positive point of concurrence is brake performance. The front regenerative electric brake is okay except if you want to stop fast and on a dime. Not many riders actually use the rear friction brake, which we assume would only help. In any case, reviewers advise people to brake early, especially when going down a hill. Several users dislike the battery meter because it isn’t accurate and precise, but “all over the map.” One person finds that the meter’s measurement fluctuates (e.g., from 80% down to 20% in minutes and back up again) based on the ride’s strain on the battery. Another rider comments that after the scooter cruises fast for only one or two miles, the battery meter drops to 10%, which seems incorrect. On the other hand, a commuter travels five miles in stop-and-go traffic but arrives with the battery at 60%. Owners like that the USCOOTERS/e-TWOW Electric Booster Plus Scooter is fairly easy to fold (be careful not to tear off the rubber power cord protector by mistake) and store at the destination or on public transit. A little heavy for some, the folded scooter can conveniently be rolled on its front wheel. The automatic front light isn’t very bright but more “like a fog lamp.” Also, it always seems to be on, needing to be turned off manually. For a review of the USCOOTERS/e-TWOW Electric Booster Plus Scooter, watch this video. With a maximum rider weight capacity of 120 pounds, the Razor Power Core E90 Electric Scooter is good for children. In fact, most feedback was from parents on the experiences of their kids who typically ranged in age from five to ten years. Its “zippiness” is great for some riders, but too fast for other. Some parents wish the Razor Power Core E90 Electric Scooter could have more than one speed. Nonetheless, it’s easy and fun to ride. It is a bit short with low and non-adjustable handlebars. 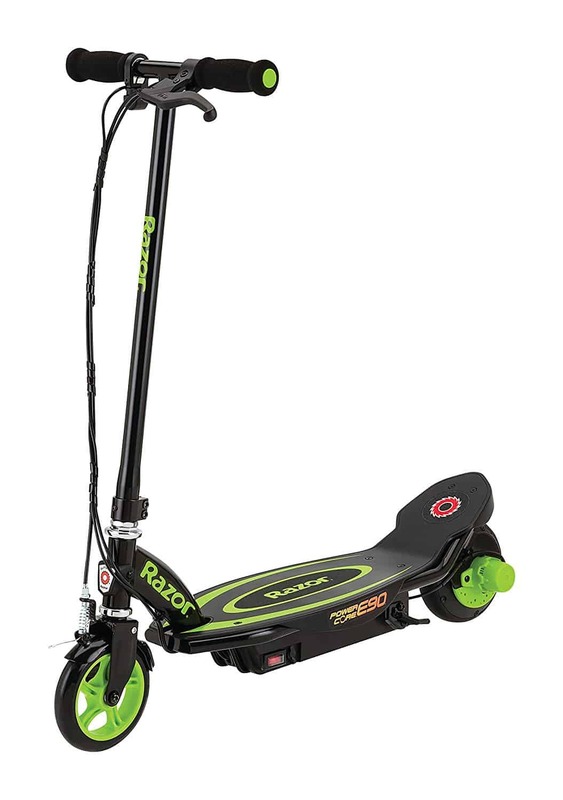 Users don’t recommend this scooter for people over 5’ tall. Two 11-year olds found this model too short for them. The battery earned conflicting reviews. Charging it overnight yields at least an hour or more of continuous use. 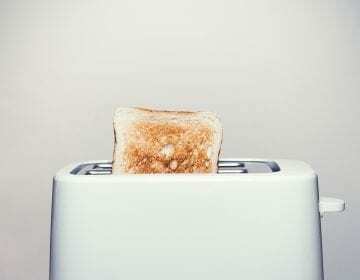 To some people, the battery lasts longer than expected–even more than energetic eight-year-olds! On the other hand, a few report the battery holds a charge less and less well after a few rides or just a few weeks. Made of hard rubber, the Razor Power Core E90 Electric Scooter’s wheels seem best suited for smooth surfaces like concrete, not asphalt. 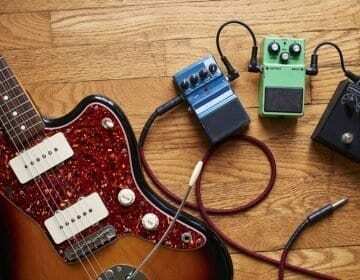 Want to hear something frustrating? We found numerous reports of the back wheel seizing up. Since the hub motor is in the back wheel, if either the wheel or the motor breaks, both must be replaced. Many people also complain about problems occurring shortly after the 90-day warranty period… too late for returns or replacements. Watch this assembly, demonstration, and review of the Razor Power Core E90 Electric Scooter. Most reviews of the Razor E200S Seated Electric Scooter were from parents and grandparents of children ages five through 13. With a maximum rider weight capacity of 220 pounds, though, this scooter is “good for young kids to grow into” and great for college students driving around campus. The Razor E200S Seated Electric Scooter is safe, stable, sturdy, and smooth. Easy to operate, it’s fun, fast, “maneuverable,” and comfortable. Although we did hear from two people who find the removable seat is uncomfortable. Although easy to charge, the battery requires many hours to charge fully. Users are disappointed that after being charging overnight, the battery yields only 30 to 45 minutes of ride time or three to four miles of range. Many users note a couple of design/mechanical flaws. First, the chain popped off for numerous riders, especially when braking suddenly and hard. The tension spring holding the chain on is weak and can fall out. Second, the back tire seems prone to going flat. Assembly is generally easy, but several consumers report their scooters arrived scratched, scuffed, dented, and perhaps even used–in torn and patched boxes. To learn more about the Razor E200S Seated Electric Scooter’s assembly and setup, watch this video. You’ve chosen a suitable model and are eager to take it out for a spin. Now, are you worried you’ll fall off a scooter? If you can ride a bike, you’ll be able to drive a two-wheeled scooter. Even if you can’t, you should have an easy time learning to balance on a scooter, with its lower center of gravity. Also, small, two-wheel electric scooters are slower than bikes, often topping out at 15-18 miles per hour. Although possible, crashes are unlikely. Especially since you can simply brake and hop off a scooter to avoid an accident. As with any vehicle, be careful on the road so you can enjoy the ride. In order to keep riding, stay safe with protective gear like a helmet, knee pads, elbow pads, and glasses. At least wear a helmet. Head injuries are common, easily sustained, and severe. Finally, in order to keep debris out of your eyes and see where you’re going, wear glasses. 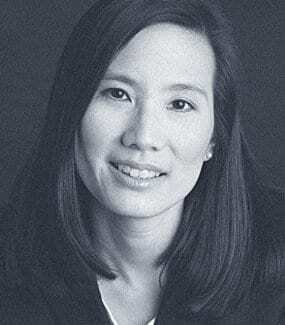 Helmets.org–a small, non-profit helmet advocacy program founded in 1989–suggests wearing a light motorcycle helmet instead of a bike helmet on an electric scooter. For rides on powered scooters “capable of maintained speeds of at least 20 mph and likely to have more interaction with motor vehicles than non-motorized activities,” the U.S. Consumer Products Safety Commission recommends a moped or motorcycle helmet. Further, they should meet Snell L-98, M-2005, M-2010, or CMS/CMR 20073 standards; DOT FMVSS 218-certified. Some states require helmets for electric scooter drivers by law–check with your local DMV. United States residents can use this handy website to find their state’s official DMV website. Many small electric scooters–like the ones we reviewed–market themselves as being low- to no-maintenance. While this may be true, as with any motorized device containing moving parts, you’ll want to take care of your electric scooter in order to reap years and miles of use. Read your model’s owner manual for proper instructions to keep your scooter tuned up and ready to go. Keeping records:Photograph or write down your scooter’s serial number and store it with other paperwork (e.g., the manufacturer’s instructions, the receipt, etc.). Also take a picture of wiring harnesses, battery connections, and overall parts placement for later reference. Not riding on wet surfaces and in the rain: Moisture interferes with and may short out the scooter’s electrical components. Electrical scooters are designed to run on hard, dry, surfaces, not through mud, wet grass, and puddles. Moisture also rusts metal parts. Cleaning: Clearing debris, dirt, and dust from your scooter will help prevent particles from coming into contact with and hindering the engine/motor and other mechanical moving parts. Do NOT douse the electric scooter with water, though. Dust it off and, when necessary, wipe it with a damp cloth before drying it completely. Special tools are available for cleaning chain driven scooters. Checking tire pressure and keeping tires properly inflated: Look in the scooter’s manual for the correct pressure level. Under- or over-inflated tires don’t touch the ground evenly, wear out faster, and affect range and speed. If applicable, checking the chain to make sure it’s not too loose or too tight. Lubricating moving parts as needed and instructed. Testing the brakes and checking brake pads. Running the battery all the way down before recharging it vs. recharging it after every ride whether or not it’s drained. Using the correct charger for the batteries. Charging the batteries fully before the first use. Parking in the shade or a shelter to shield it from prolonged direct sunlight and extreme temperatures, particularly heat. Batteries are especially affected by high temperatures.Alternatively, you can pick up a cover on the cheap. As we noted earlier, some states require helmets for electric scooter riders while others don’t. 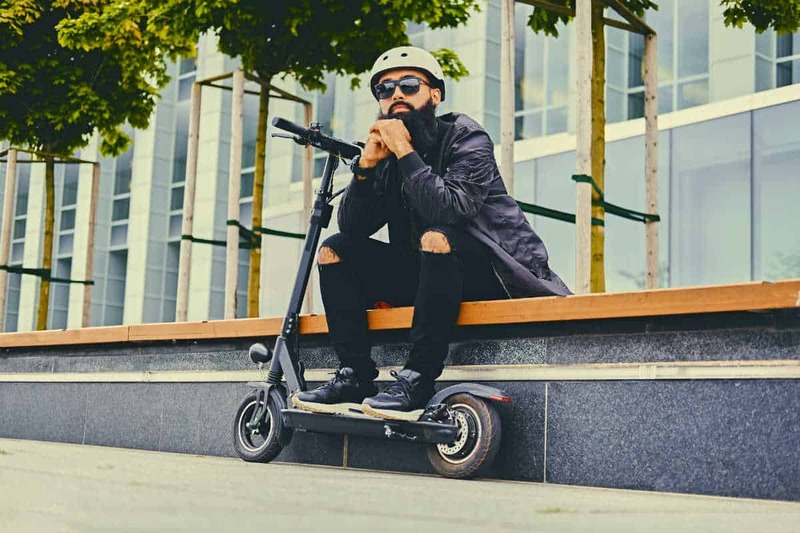 In fact, rules for electric scooter ownership and usage–licensing, registration, insurance, where they can be driven–vary from state to state. Laws applicable to your chosen model also depend on its size and speed. To navigate this myriad of regulations, check your local DMV office for your jurisdiction’s laws regarding electric scooters. What Does “Street Legal” Mean? A motor vehicle that is “street legal must have “whatever equipment or features the law would require to allow one to operate it legally on the roads at any time and without restriction.” Specific stipulations on whether or not a vehicle is “street legal” varies from state to state. Some electric scooters are considered street legal and thus can’t be driven on sidewalks. Others aren’t street legal (i.e., too slow/under 25 mph, not sturdy enough, lack sufficient suspension and safety features, etc.) and can’t be operated roads with other traffic safely. The small models we reviewed are between children’s scooters and the larger full-size electric scooters that are usually street legal. So where does this leave you to drive your small electric scooter? Again, check with your local DMV for rules applicable to your specific model. Riding on sidewalks is illegal in many places while zipping around in traffic on larger roads is illegal and downright dangerous. Neighborhood streets and bike lanes may be viable options. Electric Scooters: Revered or Reviled? Proponents of electric scooters praise their economy, ease, independence, and eco-friendliness. Conversely, people annoyed by fleets of commercial rental electric scooters littering urban sidewalks dislike them. Many citizens are angry at scooter rental companies for diverting money from public transportation, all just to make a buck. Hopefully, though, electric scooters can actually encourage the use of public transportation. In places where public transportation pick-up points are far apart (e.g., Metro stations in DC and the Maryland and Virginia suburbs), riding an electric scooter may be perfect for just getting to the subway/bus stop. Although your personal scooter isn’t one of the reviled rentals, keep a close eye on it. Vandalized scooters–burned, tossed into water, run over, etc.–have become victims of frustrated citizens expressing outrage over the invasion of rental scooters. There’s also the environmental impact to consider. Electric scooters emit no pollution according to the National Institute of Environmental Health Science. They’re quieter than cars and motorcycles (thus less noise pollution) and zero emissions. 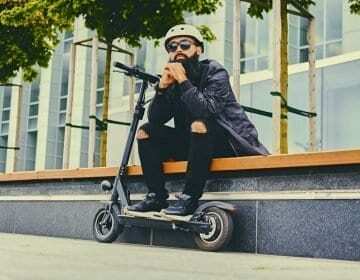 In order to find the best electric scooter for you, analyze your needs as well as each model’s features, like its size, maximum weight capacity, speed, range, performance, design, etc. Don’t forget to learn about its brakes, battery, motor, and other parts. Always ride responsibly and respect pedestrians, cyclists, other motorists, and drivers. We all share the road and would hate for a few bad apples to spoil the joy of outdoor transportation for everyone. Readers and riders, please tell us what you think. Do you agree or disagree with our advice and reviews? 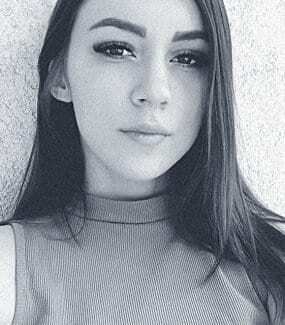 Did we leave out any information? Do you have anything to add? We’d love to hear from you. Sturdy and powerful, this scooter is fun and reliable for commuting. Adjust between econo and turbo modes for variable speeds and power levels. 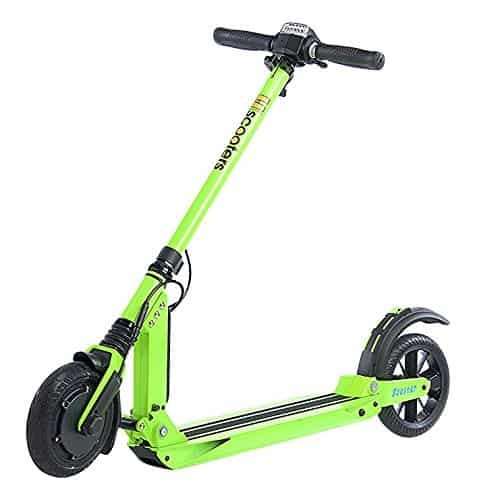 With a long-lasting battery, this solid scooter is a great investment. 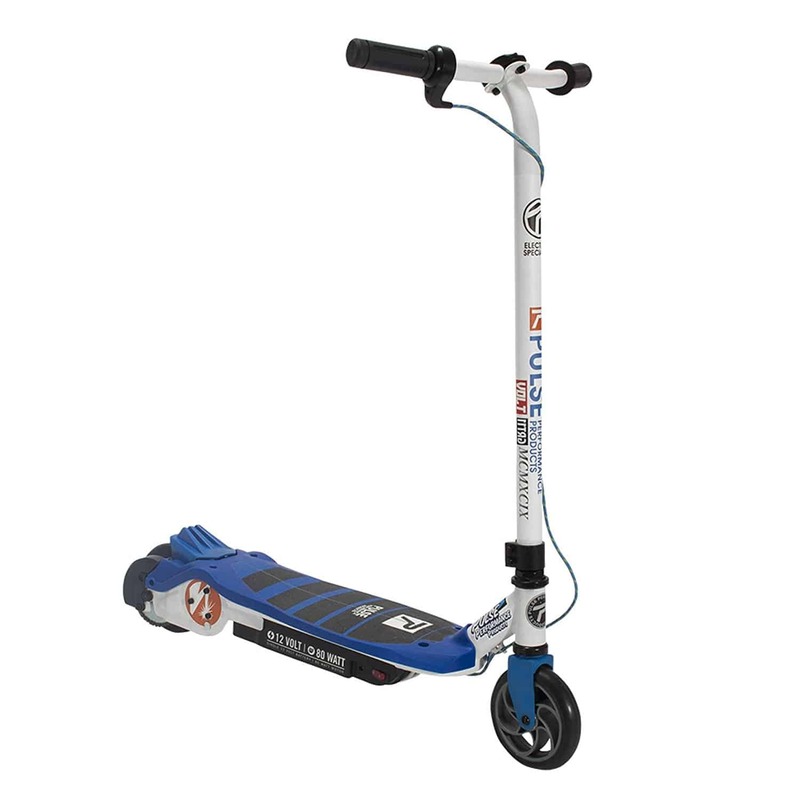 Economical and strong, this sturdy scooter accommodates kids and holds riders up to 120 pounds. 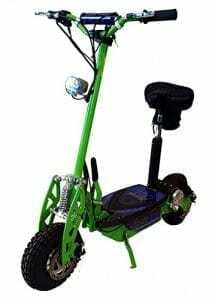 Easy to ride, handle, stop, it’s perfect for beginner scooter drivers. Zippy but not too fast, this model is great for riders not in a hurry. Is riding an electric scooter considered exercise? Driving a powered scooter doesn’t work your heart and muscles like rowing on a machine, dancing an hour of Zumba, or playing pickleball. Nonetheless, standing, balancing, and steering are more taxing than sitting in a car. How can you exercise with an electric scooter? Combine scootering with walking. Even better, carry your scooter. Navigate twisty, winding roads, hills and valleys by shifting your body weight and maintaining your balance. Whether sitting or standing, maintain excellent posture and engage your core to work your abdominal and back muscles.